Spread butter on one side of each slice of bread. Spread other side of each bread slice with Russian dressing. 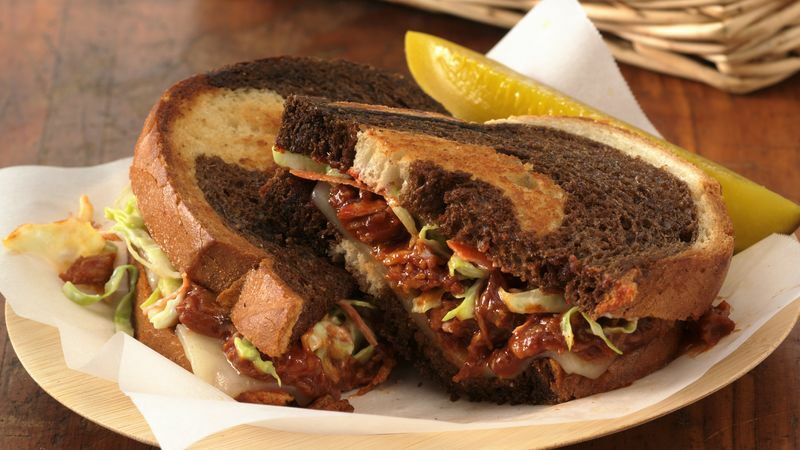 On each of 2 slices of bread, salad dressing side up, layer 1 slice cheese, 1/4 cup barbecue sauce with shredded pork and 1/4 cup coleslaw. Top with 2 bread slices, salad dressing side down. Heat 12-inch skillet or griddle over medium heat until hot. Cook 2 sandwiches in hot skillet 4 to 8 minutes, turning once, until golden brown. Meanwhile, make remaining 2 sandwiches. Cook remaining 2 sandwiches as directed. Serve hot sandwiches with dill pickle spears.